Mother Nature seems to be confused offering 12 degree temps (54 degree Fahrenheit) in June. So I thought it would be OK to talk about fur – mostly fun faux fur. I have had this photo in my inspiration folder for some time, a tear-out from Style at Home magazine. The magazine made mention of statement pieces like the well-styled bookcases, the hide rug, table and vase – which are all very lovely. But who could ignore that outstanding/amazing flokati-covered chair. Not Me!!!! Another chair that caught my attention is The Cutie Chair by Munna Design of Portugal whose mission is to ‘transform emotion into products’. 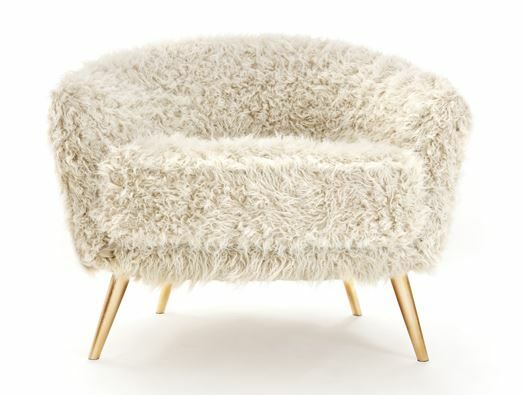 The Cutie Chair with its faux fur and gold leaf legs certainly fills me with emotions of happiness! The Ciprio designed by Fernando e Humberto Campana for Edra is a wonderfully playful iconic piece. 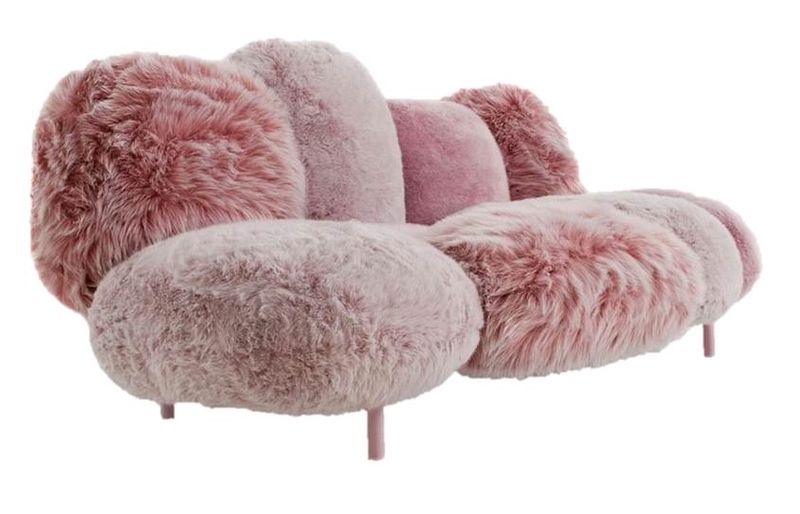 The settee has 9 cushions fixed to an invisible metal tube frame, stuffed with Gellyfoam® and covered in ‘ecological fur ‘available in different fur lengths. Fun, fun, fun! This chair seen on houzz.com is a Mid Century Modern classic piece covered in faux fur. Serious but not too serious. So I decided to do my own version of a faux fur covered chair. 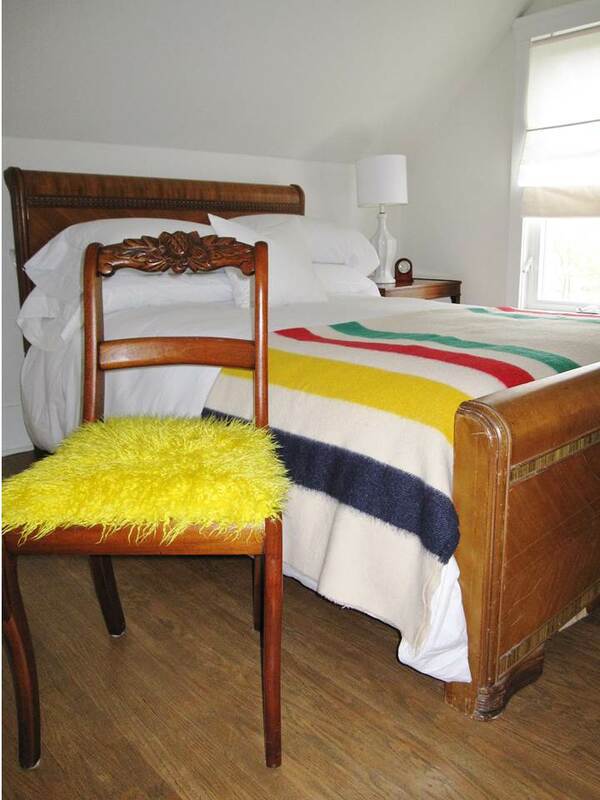 I went with yellow to give a pop of colour in a very white guest room plus it matched one of The Hudson Bay stripes in the Point Blanket. My family have coined it the ‘Big Bird Chair’ (à la Sesame Street). Oh well….it makes me smile! This entry was posted in Design, Home and tagged DECOR, diy, fabric, furniture, HOME, Interior Design, style by Modmissy. Bookmark the permalink. Love your yellow chair! We were just in Austria in March and one of the best parts was that they had sheepskins thrown over all the chairs in the outdoor cafes, and sometimes throws too. So cozy! Austria sounds wonderful. I was there a very long time ago. 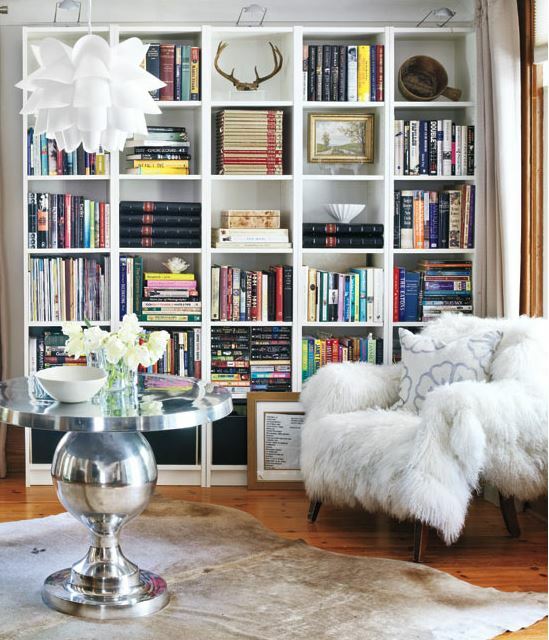 I like the image of sheepskins adorning chairs. Truly the vision one would have of Austria in winter!